Most of what I know about bitlbee comes from the home page. I don’t have much occasion to use bitlbee, mostly because I don’t spend much time in chat channels. I respect them as a viable source of information, but I find them a bit saccharine at times. That being said, an IM client that splices with an IRC tool is probably quite useful for a lot of people. I took a little time and tried to set it up today; following the Arch Wiki was a breeze, but once I had it going I realized I didn’t have anyone to chat with. Again. So I can assume it works like it should, even though I haven’t actually used it. I hear quite a few testimonials, particularly among people who are fans of irssi. I suppose it works within other chat clients too. Chime in if you have an experience to report. This entry was posted in Linux and tagged chat, client, instant, messenger on 2013/06/26 by K.Mandla. I’ve been using Bitlbee + Weechat for a long time. Mostly I use it to message my wife and kids either via AIM phone-number addresses or Gtalk when I’m sitting at my computer. 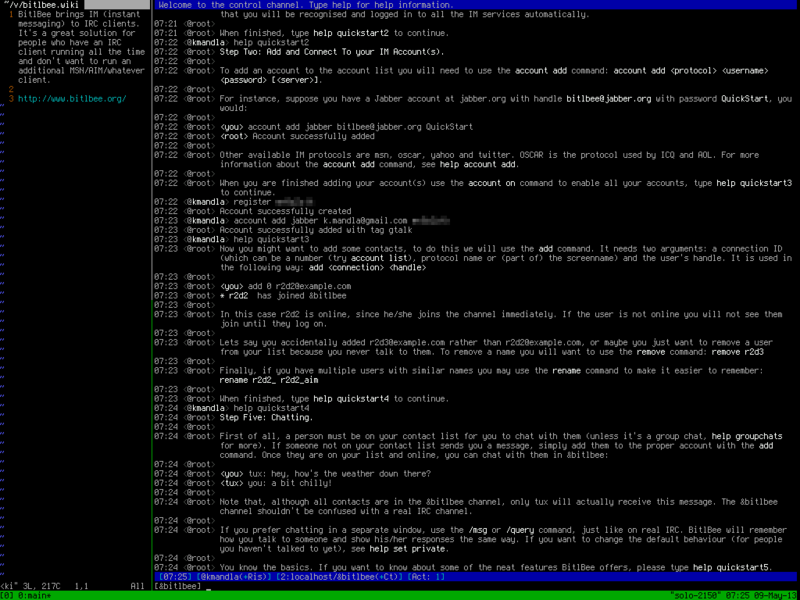 Although I do keep several IRC rooms open (#archlinux, #mutt, etc.) in case I’m really bored :). It starts automatically and just runs quietly alongside mutt in a tmux instance until I need it. Looks interesting, would you care to describe what you find better? Don’t forget that bitlbee can be made to work with OTR. For me bitlebee and irssi are an easier setup the mccabber.